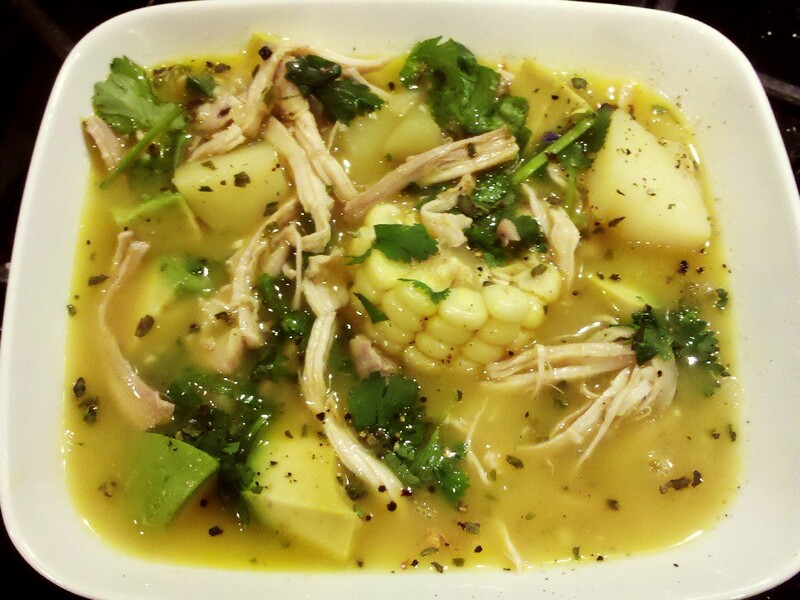 If you want to eat this soup in true Latino fashion, eat with warm rolled up corn tortillas. Delicioso! Serves 4. You might say this sopa goes well with a cold Mexican beer like Cerveza Pacifico (yum) … but why not wine too? I enjoyed with a chilled 2010 Raymond Hill California Chardonnay. In a large pot add the chicken broth and 1-1/2 cups water and bring to a boil. Add the chicken and corn and simmer until the chicken is cooked through 12-13 minutes. 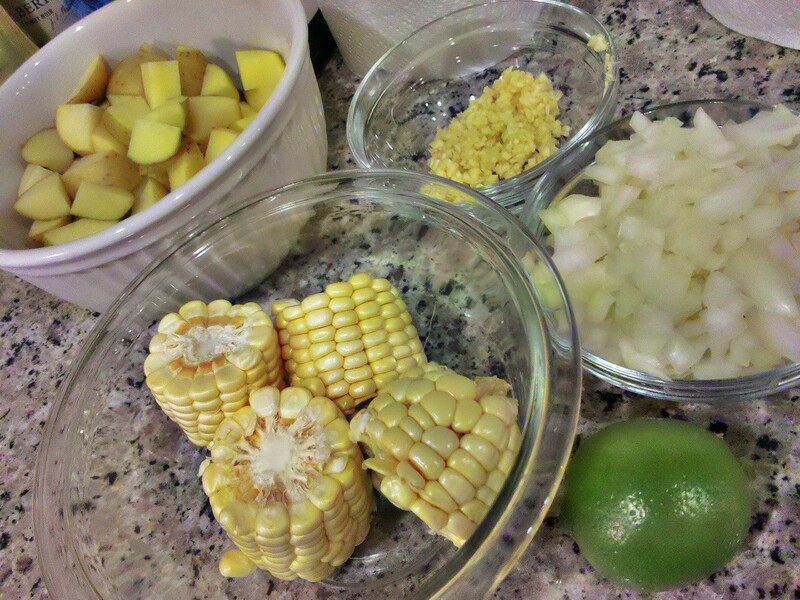 Remove the chicken and corn from the pot and set aside. Pour out the broth into another pot or a heat-proof bowl and set aside. In the now empty pot over medium heat add the oil, onion and garlic and stir fry for 2 minutes. Add the potatoes and stir fry another minute. Add the broth back and bring to a boil. Lower heat and simmer until potatoes are cooked through about 12 to 15 minutes. If liquid starts to evaporate too much add 1/4 to 1/2 cup water depending how much has evaporated. While your potatoes are cooking, shred the chicken. 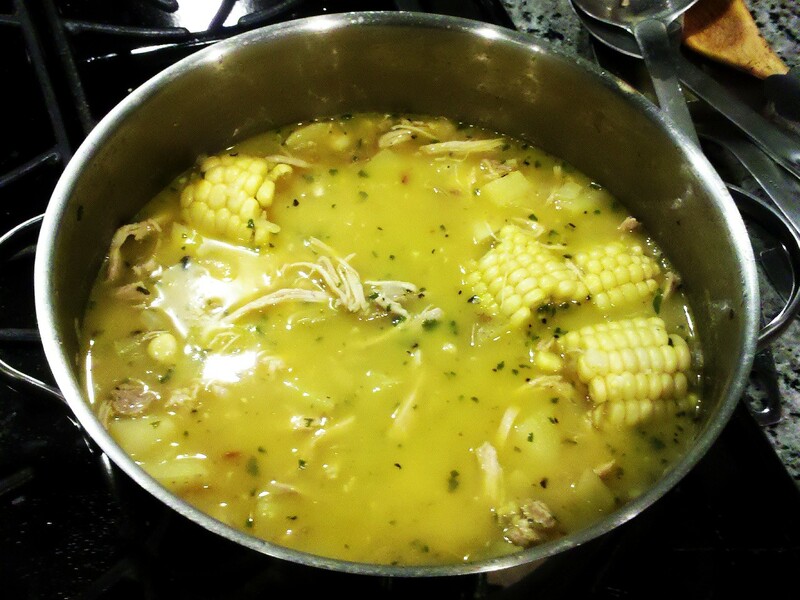 Add the shredded chicken and corn back into the soup. Add the lime juice, 1/2 teaspoon oregano, 1/4 teaspoon pepper and cook 30 seconds more. 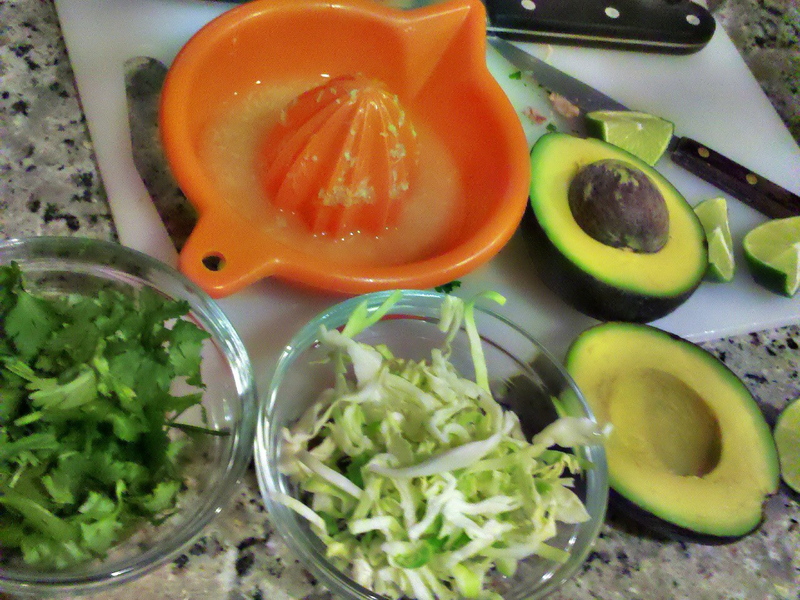 Serve soup topped with avocado and serve with the sides of oregano, cilantro, cabbage and lime wedges. Remember to warm up your corn tortillas! Thank you! Your blog is the most exotic food blog I’ve seen yet. I recognized the jicama, I’ve heard of cardamom but can’t say I know what it is and first time I see Fenugreek – I’m guessing it’s the green leafy I see in the photo. I have a lot yet to learn – which I fin amazing about cooking always something new to discover or re-invent. This soup looks great. Not too heavy for the last parts of spring! I love the corn on the cob inside, too. Thank you for your comment, Colleen! Yes, corn inside the soup very Latin-style. 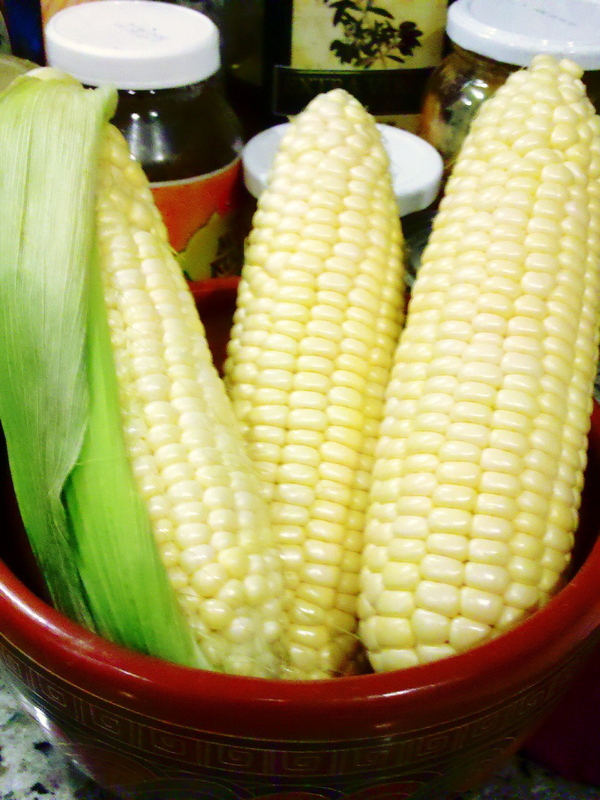 You just pick up your corn with your fingers and eat. Your recipe reminds me of a soup that I had at a lovely Peruvian restaurant. Looks delicious. Thanks Karen. I haven’t been to a Peruvian restaurant in decades. I remember that they make great seafood soups. Thanks, Kathy, for the nice compliment, especially coming from a chef. I have 1 aunt and 1 uncle (from my Chinese side of the family) who own and run 3 Chinese restaurants they started many years ago in Guatemala. WOW! That looks so delicious. It makes me want to go make it right now. Thanks for the post. Thank you for the compliment! Makes me want to make the soup again … next week. Thank you for your comment. I think you’ll like it! This looks amazing! Just like my dad would make for me when I was young (like his grandma did before him). I’ve never made it myself but I think you may have inspired me. Thanks! Thank you for your comment, Aja! Not many places you can find a soup like this anymore but they’re still best when they’re home-made. That was the first time I made it myself. Looks delicious; love the look of the corn cobs floating in the broth. Thank you for your comment, Sara! I’ll have to make it again and double the recipe – it was gone in no time. I’ve never seen a soup like this & it looks great. Definitely on my will make soon list. Gosh, wish I had some for lunch right now. Thank you for your comment! It’s a fantastic soup. Try it soon. Looks delish!! I am a soup fanatic, can’t wait to try this! Thank you for your comment! It’s really a delicious soup.